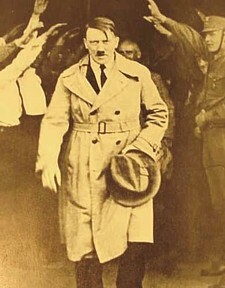 Adolf Hitler rose to power in the aftermath of World War I as Germany struggled under the economic burden of reparations imposed on them by the Versailles Treaty. A dynamic speaker, Hitler scapegoated various groups including German political leaders, liberals, capitalists and Jews for Germany's troubles. By 1933, his popularity resulted in his appointment as Chancellor, a position he used to undermine the existing government and become dictator. Persecution of the Jews began immediately. The first concentration camp was built at Dachau in 1933. A series of repressive laws beginning in 1935 marginalized Jews and limited their ability to make a living. Mass murder of Jews began in the concentration camps in the early 1940s. Other groups the Nazis considered undesirable, including gypsies and homosexuals, were also persecuted and sent to extermination camps. Some courageous Germans did secretly protect Jews or, like the minister Dietrich Bonhoeffer, speak openly against the Nazis. In 1944, a group of German military officers tried to assassinate Hitler. In 1939, Germany invaded Poland, setting off the Second World War. Novels about German military personnel serving in World War II appear on the World War II page. Jonathan Crown, Sirius (2015), about a terrier, a Jewish family's pet who becomes a Hollywood star and then Hitler's lapdog. Ron Hansen, Hitler's Niece (1999), about the high-spirited Geli, daughter of Adolf Hitler's half-sister, and her relationship with Hitler from his origins as an unsuccessful artist teased at family gatherings through his rise to power as the Nazi dictator. Sibylle Knauss, Eva's Cousin (2002), about a twenty-year-old German woman whose cousin Eva Braun invites her to be a guest at Hitler's opulent mountain retreat in Bavaria. Norman Mailer, The Castle in the Forest (2007), a novel about Adolf Hitler's childhood which imagines that his life was shaped and guided by a demon following the instructions of Satan. A.N. Wilson, Winnie and Wolf (2007), a novel which imagines what might have happened if Adolf Hitler and Winifred Wagner, the daughter-in-law of the famous composer, had an affair during the years between the wars. Martin Amis, The Zone of Interest (2014), about a liaison sent to a concentration camp who begins an affair with the camp commandant's wife and becomes horrified by he camp's purpose, after which he and his lover try to undermine the commandant's work. Maria Angels Anglada, The Violin of Auschwitz (1994 in the original Catalan; first English edition 2010), about a violin-maker imprisoned at Auschwitz who is forced to create another instrument, despite his exhausted condition, after his profession becomes known. Dianne Ascroft, Hitler and Mars Bars (2008), about a boy living in a German children's home whose mother stops visiting after a bombing raid, and who is then sent to live in Ireland with a sequence of foster families; self-published. Will Berthold, Lebensborn (in German 1958; English edition 1977), about a German woman chosen to be part of the Lebensborn program and forced to mate with selected men for the purpose of breeding supposedly superior children. Ethan Canin, Carry Me Across the Water (2001), about a Jewish boy who escapes Nazi Germany and builds a new life in America, told in the form of his memories as an old man. Betsy Carter, The Puzzle King (2009), about a Jewish couple who met in New York after immigrating as children from Nazi Germany who return to Germany in 1936 to help family members escape the country. Piero degli Antoni, Block 11 (2012), about ten prisoners in Auschwitz who are caught in an escape attempt and forced to decide which will be executed at dawn to spare the rest from execution. Len Deighton, Winter: A Novel of a Berlin Family, about two brothers with distinguished military careers who react in opposite ways to the rise of Hitler. Otto de Kat, Julia (2011), about a factory owner who kills himself in 1981 and his past as a student in Lubeck, Germany, who falls in love with a young woman who opposes the Nazis. William Dietrich, Ice Reich, about an expedition sent to Antarctica by Nazi Germany. John Donoghue, The Death’s Head Chess Club (2015), about a Nazi officer who sets up a chess club for the soldiers at Auschwitz and the Jew in the camp who is said to be an unbeatable chess player. Esi Edugyan, Half Blood Blues (2011), about a young, half-black jazz trumpeter who leaves Berlin after the Nazis ban "degenerate" music, only to disappear in Paris in 1939, and a fellow band member who still carries a burden of guilt fifty years later. Hans Fallada, Every Man Dies Alone (1947; English translation 2009), about a German couple who quietly begin to resist the Nazis after their son is killed in the invasion of France; a contemporary novel when first published. Denise Giardina, Saints and Villains (1998), about Dietrich Bonhoeffer, the German theologian killed by the Nazis after becoming involved in a failed plot to assassinate Hitler. Eliza Granville, Gretel and the Dark (2014), about a young girl in Nazi Germany, and turn-of-the-century Viennese psychoanalyst Josef Breuer and a patient of his who claims to be a machine. Hugo Hamilton, Disguise (2008), about a sixty-year-old German man's attempt to learn the truth about his family's lives, disrupted in the chaos at the end of the Second World War. Lindsay Hawdon, Jakob's Colours (2015), about a gypsy boy who flees alone, traveling across Germany in 1944 to escape Hitler's Gypsy Holocaust, and his memories of his parents. Olivia Hawker, The Ragged Edge of Night (2018), about a German friar who, after his school is seized by the Nazis, enters a marriage in name only to a widow with three children. Ursula Hegi, Stones from the River (1994), about a girl who is a dwarf growing up in Nazi Germany. Raphael Jerusalmy, Saving Mozart (2013), about a music critic confined to a tuberculosis sanitarium in 1939 Salzburg who fights back against a Nazi plan to use a Mozart festival as a fascist event. Daniel Kalla, The Far Side of the Sky (2012), about a Jewish father and daughter who flee to Shanghai from Germany after the Nazis begin persecuting Jews in 1938; #1 in the Adler Family trilogy. Daniel Kalla, Rising Sun, Falling Shadow (2013), about a Jewish father and daughter who, after fleeing Germany to Shanghai, struggle to survive and keep their hospital for refugees open after Japanese invaders force Jewish refugees into a ghetto; #2 in the Adler Family trilogy. Daniel Kalla, Nightfall over Shanghai (2016), about a Jewish father and daughter living in Shanghai when it is occupied by the Japanese; #3 in the Adler Family trilogy. Thomas Keneally, Schindler's List (1982) (titled Schindler's Ark in the U.K.), about Oskar Schindler, a German factory owner who saved numerous Jews from the Nazi extermination program between 1939 and 1945. Ayse Kulin, Without a Country (2018), about a Jewish family who flee Germany to escape Hitler and settle in Turkey where, as the years pass, they must again cope with anti-Semitism. Jonathan Littell, The Kindly Ones (2006; original French title Les Bienveillantes, titled The Wellwishers in the U.K.), an epic novel in the form of an autobiography by a fictional Nazi officer who lives in France after the war and reinvents himself as an entrepreneur and family man; originally published in France where it won the 2006 Prix Goncourt. Audrey Magee, The Undertaking (2014), about a German soldier and the woman he has not met, but marries so that he can gain a honeymoon leave and she can qualify for a pension if he is killed. Sarah McCoy, The Baker's Daughter (2012), about a present-day Texas journalist and the German immigrant she interviews who remembers her experiences as a teen in Nazi Germany in the last of the war. Brendan McNally, Germania (2008), about four Jewish brothers, quadruplets and former vaudeville performers with psychic abilities, who are unexpectedly reunited in the turmoil surrounding Hitler during the final days of World War II. Judith Claire Mitchell, A Reunion of Ghosts (2015), about three sisters, descended from a German-Jewish scientist who developed the lethal gas used for mass killings in Nazi concentration camps, who decide to kill themselves at the close of the 20th century and write a history of their family as their collective suicide note. Heather Morris, The Tattooist of Auschwitz (2018), about a Slovakian Jew forced to work as a tattooist in the Auschwitz concentration camp; based on a true story. Saskia Sarginson, The Other Me (2016), about two brothers in 1930s Germany, a high school girl in 1986 London embarrassed by her German father, and a girl in 1995 Leeds who aspires to a career as a dancer. Simon Scarrow, Hearts of Stone (2015), about a young German with friends on the Greek island of Lefkas, who returns there as a spy during WWII. Helena P. Schrader, An Obsolete Honor: A Story of the German Resistance to Hitler (2008), about a young German officer who joins a group of other officers working to overthrow Hitler; self-published. Angelika Schrobsdorff, You Are Not Like Other Mothers (2012), about a Jewish German woman and her three children by three different men, from World War I through World War II. Rachel Seiffert, The Dark Room (2001), about three ordinary Germans and their experiences of life during and after the Nazi era. Sarah Jane Stratford, The Midnight Guardian (2009), about a woman vampire sent to Berlin in 1938 as part of a team of vampires seeking to disrupt the Nazi war machine, as Nazis persecute vampires along with other undesirables, and the vampires fear the brewing war may deplete their supply of human blood. Julie Thomas, The Keeper of Secrets (2013), about a fourteen-year-old German Jewish boy sent to Dachau, his family's treasured 1742 Guarneri del Gesu violin, and a present-day orchestra conductor inspired by the playing of the boy's grandson. Ellen Marie Wiseman, The Plum Tree (2013), about a German servant girl who falls in love with the son of the wealthy Jewish family she works for, just as Hitler comes to power. Richard Zimler, The Seventh Gate (2007), about a group of former circus performers, some Jews, some deformed or disabled, who band together for protection as the Nazis rise to power. Marcus Zusak, The Book Thief (2005), about an orphaned German girl during World War II who steals books and shares them with her neighbors and with the Jewish man hidden in her foster-father's basement. Rebecca Cantrell, A Trace of Smoke (2009), about a woman crime reporter in 1931 Berlin searching for the killer of her brother, a cross-dressing lounge singer; #1 in the Hannah Vogel mystery series. Rebecca Cantrell, A Night of Long Knives (2010), about a woman journalist in 1933 and her search for her son after the two of them are kidnapped and separated; #2 in the Hannah Vogel mystery series. Rebecca Cantrell, A Game of Lies (2011), about about a woman journalist wanted by the SS who poses as a travel writer to collect Nazi secrets during the 1936 Berlin Olympics; #3 in the Hannah Vogel mystery series. Rebecca Cantrell, A City of Broken Glass (2012), about about a woman crime reporter trapped in Berlin with her son in 1938 on the eve of Kristallnacht; #4 in the Hannah Vogel mystery series. Barrett J. Clisby, Lost Treasure of the Fourth Reich (2011), a thriller about the Nazis and a "Red Leather Book" containing toxic secrets, and a present-day explorer who uncovers a sunken German submarine containing both gold and the book. William Dietrich, Blood of the Reich (2011), a thriller about a present-day software publisher in Seattle and her mysterious connection to a pre-WWII Nazi quest for an occult energy source in Tibet and an American zoologist's attempt to prevent the Nazis from finding it. Colin Fulton, The Reichsbank Robbery (2012), a mystery based on the unsolved real-life case of part of a cache of gold bars from Germany's state bank in Berlin in 1945 which disappeared during a U.S. bombing offensive against the city. Philip Hook, The Soldier in the Wheatfield (1998), about the modern buyer of a German landscape painting whose recent owners all died violently, who discovers it is connected to a World War II mystery involving a German officer. David John, Flight from Berlin (2012), a thriller about a British journalist covering the 1936 Olympics in Berlin and an American swimmer whose rebellious behavior resulted in her being dropped from the U.S. team. Philip Kerr, The One from the Other, about a German detective searching for proof that a woman's husband, a war criminal, is dead; #4 in the Bernard Gunther (Berlin Noir) series. Philip Kerr, A Quiet Flame, about a German detective who poses as an escaped Nazi war criminal to solve a murder case in Argentina; #5 in the Bernard Gunther (Berlin Noir) series. Philip Kerr, If the Dead Rise Not (2009), about the house detective for a Berlin hotel who becomes involved with a left-wing journalist and a Jewish gangster as he investigates two deaths in the hotel during the 1934 preparations for the Berlin Olympics; #6 in the Bernie Gunther (Berlin Noir) series. Philip Kerr, Field Gray (2010), about a former German detective whose plans to emigrate to the U.S. in the aftermath of the war go awry, sending him back to Europe with an obligation to work for the French; #7 in the Bernie Gunther (Berlin Noir) series. Philip Kerr, Prague Fatale (2012), about a private detective forced back into police work to protect a Nazi official, whose adjutant is subsequently found dead in a locked room; #8 in the Bernie Gunther (Berlin Noir) series. Philip Kerr, The Lady from Zagreb (2015), about a Berlin policeman sent to Zurich in 1943 to find an actress, a mission complicated by the woman's family connections; #10 in the Bernie Gunther series. Jane Thynne, Black Roses (2013), about an aspiring English actress who, while in Berlin in 1933, becomes acquainted with a group of Nazi wives including Magda Goebbels, and is asked to work undercover for British intelligence; #1 in the Clara Vine series. Jane Thynne, The Winter Garden (2014), about an actress who works as a British undercover agent in Berlin in 1937 and discovers that the murder of a young woman being trained to become an SS officer's wife is linked to an ominous secret; #2 in the Clara Vine series. Jane Thynne, The Scent of Secrets (2014; titled A War of Flowers in the U.K.), about a British actress who, at the request of the Secret Service befriends Hitler's girlfriend Eva Braun so she can pass information to the British authorities; #3 in the Clara Vine series. Jane Thynne, The Pursuit of Pearls (2015; titled Faith and Beauty in the U.K.), about a British actress and spy in Berlin who is recalled to London just as she is offered the most ambitious role in her career; #4 in the Clara Vine series. Robert Wilson, A Small Death in Lisbon (1999), about a modern police detective in Portugal whose investigation of a teenage girl's murder links back to the experiences of a Berlin factory owner forced into Hitler's SS in 1941.